COVENTRY MESSAGE BOARD • View topic - When will bins be emptied over Christmas and New Year? When will bins be emptied over Christmas and New Year? Everybody deserves a break at Christmas and that includes the hard-workers that collect our wheelie bins each week. 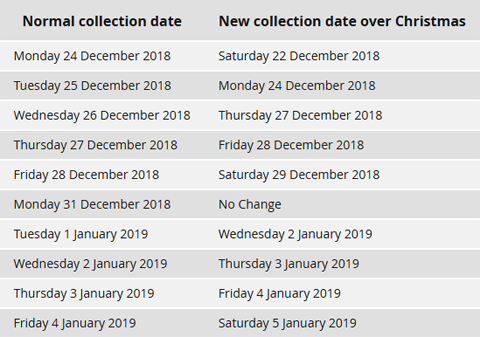 You may find that your collections date changes over the festive period so it's important to take note of the following information. Christmas is a time to indulge which means your bins are likely to be full to the brim - and no one wants an overflowing bin for an extra week. And as an extra special Christmas present, some councils will even be making additional collections for the festive period too! We've compiled a list of bin collection changes for Coventry and Warwickshire so you don't get caught out. There will be no bin collections at all in Coventry during the week beginning Monday, December 24. Instead there will be an extra collection of household waste, instead of a brown bin collection (food waste) either the week before or after Christmas, depending on when your brown/blue lid collection is scheduled. Collections for the week beginning December 31 will be postponed by one day. So if your collection is due on Tuesday, it will be on Wednesday instead, and so on. In addition to your blue lidded recycling bin, you will also be able to put out two clear sacks of recycling for your first blue bin collection after Christmas. In Rugby there will be no green bin collections during the week beginning December 24 or the following week beginning December 31. Household waste and blue-lid recycling collections that are due on Christmas Day and Boxing Day will change. Bins due to be collected on Christmas Day will be collected on Saturday, December 22. Bins due to be collected on Boxing Day will be collected on Saturday, December 29. Collections due on Christmas Eve, December 27 and December 28 will not be affected. All other collection days will remain as normal, including on Tuesday, January 1. Your bin will need to be ready for collection by 7.30am. There will be no refuse or recycling collections on Christmas Day, Boxing Day or New Year's Day in Warwick and Leamington. Normal collections will resume on Monday, January 7. Bins, boxes and bags need to be presented at the edge of your property by 7am on your amended collection day. If you have extra recycling over the festive period you can put it in a sturdy bag or small box (please keep each material separate) and place it beside your red boxes and bags. You will need to flatten or cut large cardboard into pieces no larger than 1m x 1m. Also, note that there will be no bulky waste collections on Monday, December 24. Bulky waste collections will resume the following week. Bin collections scheduled for Monday, December 24 will remain as normal. There will no collections between Christmas Day and Friday, December 28. Bins due to be collected on Tuesday, December 25 will instead be collected on Saturday, December 29. There will be no collections on New Year's Eve or New Year's Day. Collection schedules will pause during the break and then resume afterwards, where it left off. So for example, if your red bin was collected before the break, your black bin will be collected next when the service resumes. On your first black bin collection day after Christmas and New Year you can leave out an additional three bin bags of rubbish. Re: When will bins be emptied over Christmas and New Year? Got mine emptied a week earlier than usual. Didn't really need to but better safe than sorry. 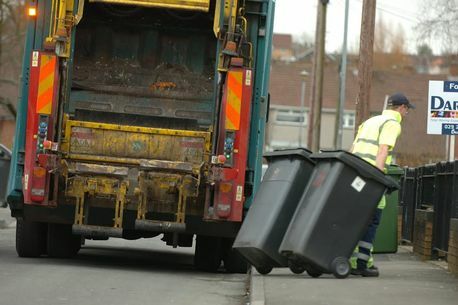 Missed bin collections which have left some streets in Coventry looking “like a refuse dump” will finally be collected. Residents have been complaining to the council after blue bin collections were not carried out as planned last Saturday (January 5). Some of those affected say they have not had their recycling picked up since December 14 – almost four weeks – due to the Christmas break. While not providing a response as to why the collections were missed, the council said it hoped to have the issue resolved by the end of the week – a week later than planned. A spokesman added: “Our crews were out last week collecting bins after Christmas and the New Year including extra recycling in clear sacks. “We got to the vast majority of people, but we are asking anyone we have missed to leave their bins and sacks out and we will get to them as soon as we can.